We open with a back story on Penny Black who is the hero Britannia when she is wearing her special Britannia armor. Penny served aboard an ultra high tech British destroyer and when something went wrong on this ship the ship's technology fused with her body. The British Navy sees her now as an unexpected experimental breakthrough and they build the Britannia armor to focus her powers. After the origin story opening we are back to the action we found ourselves in at the end of Flashpoint: Lois Lane and the Resistance #2 where one of the resistance has betrayed the group and alerted the Amazonian Furies. Bobbie Stephenson holds a knife to Lois' throat promising to slit it if the resistance doesn't surrender to the Amazons so that Bobbie can get help with her transforming into Hyde problem. 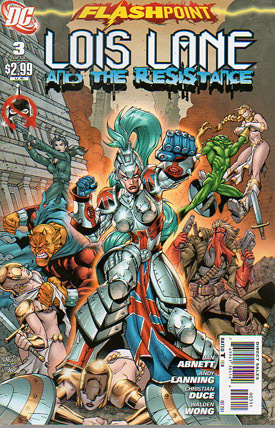 As the resistance is surrendering Hyde begins to take control of Bobbie's body and with the threat to Lois out of the way the fight between Grifter's group and the Furies begins. During the fight Penny and Lois slip away to look for the Britannia armor. They are entering a door where the armor is when Penny is shot in the back with an arrow by Artemis (Amazon). Lois tries to give Penny time to put the suit on by taking on Artemis. As Artemis is about to kill Lois Britannia flies in and flies through Artemis' body creating a bloody mess. Britannia begins to fly out to rescue the others when Lois sees something that might be useful. The next scene shoes Britannia flying through London attempting contact Grifter when she is ambushed by Wonder Woman. We get a good fight scene that ends up with Britannia getting the upper-hand and showing Wonder Woman one of the Amazon's prison ships. Wonder Woman is shocked that the Amazons have been taking prisoners and says she knew nothing of this. She then begins freeing all of the prisoners. Meanwhile, Lois is transmitting the story of what is happening in London to all of the world and she is pleading for help for the resistance. This scene ends with a few armed Amazonians sneaking up on Lois, and in the frame from a distance we can see that there is an explosion. We don't see Lois again in this story, but this particular scene continues in Flashpoint: Project Superman #3. This story ends with all of the recently freed prisoners joining the Resistance and the group is finally able to take the Amazon's head on. "To be continued in Flashpoint #5". Story - 3: This is the best of the 3 in this tie-in. These characters were developed in the first two and this last one takes advantage of that by telling a good story. We get a few really nice fight sequences, and I really enjoyed seeing this story play right into the first part of Project Superman #3. Art - 4: This comic was drawn very well, and Christian Duce drew my favorite Lois and other characters of the 3 different tie-in artists. Cover Art - 3: This makes 2 out of 3 covers in Lois' own book that she doesn't get the featured spot on the cover. On top of that, she is drawn almost as an afterthought in the background.